For courses in Liberal Arts Mathematics and Quantitative Literacy. The 7th Edition of Using & Understanding Mathematics by Jeff Bennett and Bill Briggs aims to prepare students for the mathematics they will encounter in other college courses, future careers, and life. The authors' goal is to develop students’ ability to reason with quantitative information in a way that will help achieve success in their careers, and to give students the critical-thinking and quantitative reasoning skills needed to understand major life issues. 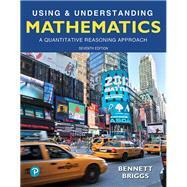 Through new resources in MyLab™ Math and updated content within the text, the Bennett/Briggs team continues to set the standard in quantitative reasoning instruction. By combining trusted author content with digital tools and a flexible platform, MyLab Math personalizes the learning experience and often improves results for each student. William L. Briggs has been on the mathematics faculty at the University of Colorado at Denver for 22 years. He teaches numerous courses within the undergraduate and graduate curriculum, and has special interest in teaching calculus, differential equations, and mathematical modeling. He developed the quantitative reasoning course for liberal arts students at University of Colorado at Denver supported by his textbook Using & Understanding Mathematics. He has written two other tutorial monographs, The Multigrid Tutorial and The DFT: An Owner's Manual for the Discrete Fourier Transform, as well as Ants, Bikes, Clocks, a mathematical problem-solving text for undergraduates. He is a University of Colorado President's Teaching Scholar, an Outstanding Teacher awardee of the Rocky Mountain Section of the MAA, and the recipient of a Fulbright Fellowship to Ireland. Bill lives with his wife, Julie, and their Gordon setter, Seamus, in Boulder, Colorado. He loves to bake bread, run trails, and rock climb in the mountains near his home. Brief Review: What Is a Ratio? 5B. Should You Believe a Statistical Study? Activity: Are We Smarter Than Our Parents? In Your World: Is Polling Reliable? 12A. Voting: Does the Majority Always Rule?